Through the years I have met many of the best athletes in skiing. From club level kids that have risen to X Games podiums to Stein Eriksen, each time I meet someone who has competed at a world class level I am fascinated by what motivates them. What drives them to risk so much in a sport that many see only as recreation? With Deer Valley Resort’s World Cup week about to begin, I sat down in the Snow Park Lodge with two members of the U.S. Ski Team, Bryon and Brad Wilson, to find out more about their lives as World Cup Mogul Athletes, and did my best to not ask who would win in a head to head dual mogul race. Bryon: One thing about freestyle that is appealing is that you can always improve in some aspect of the sport, whether it’s turns, speed, or degree of difficulty in jumps, there’s no perfect run. There’s an idea of perfection. 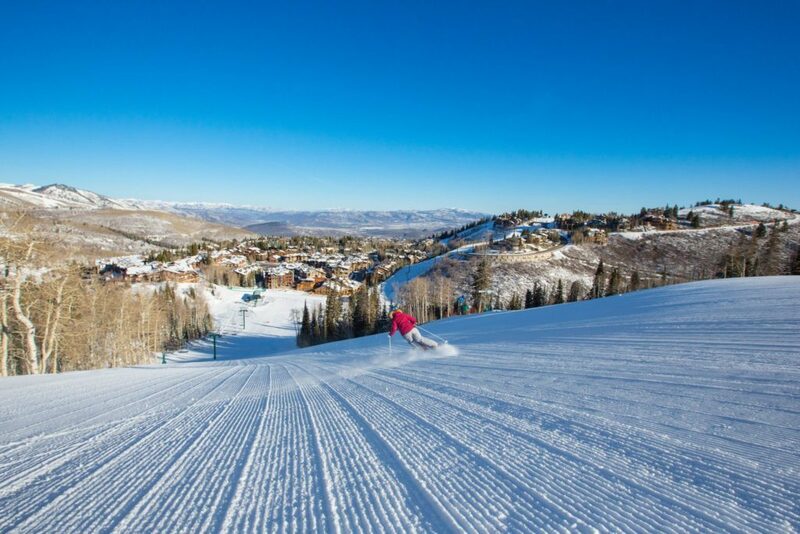 Brad: When we first started skiing as just weekend skiers, the best skiers on the mountain were the freestyle team, they were shredding the bumps. If you knew how to ski bumps, you knew how to ski everything else. How close have you come to perfection? 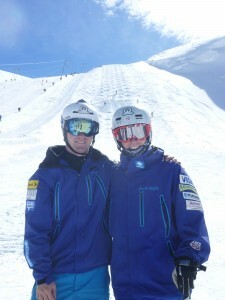 Bryon: I had one run in Are, Switzerland, for Junior World Championships..
Brad: I was thinking that same run for you. Bryon: Yeah, everything happened. I nailed my top jump, skied out of it fast, perfect, came down and nailed my bottom jump too. Bryon: And it was fast. I scored something ridiculous like 28.6 or something. Brad: Out of thirty, it’s the highest score in FIS history. Bryon: It happened at the Olympics too, when I got my bronze medal, everything came together. Everything was crisp and clean, kind of fell into place. It was special. When it goes wrong what is your thought process? Bryon: Relax the body and take the hit. In Lake Placid I hit a control gate on the right side, and it threw me into this, like death spin down the side of the course and I hit about eleven posts. Bryon: They taught us how to fall in gymnastics, how to relax. Brad: Our Mom said growing up you’re never going to get better unless you crash. The speed athlete’s take through the mogul course is incredible. How fast? Bryon: I think about thirty-two, thirty-five miles per hour. I use a metronome. 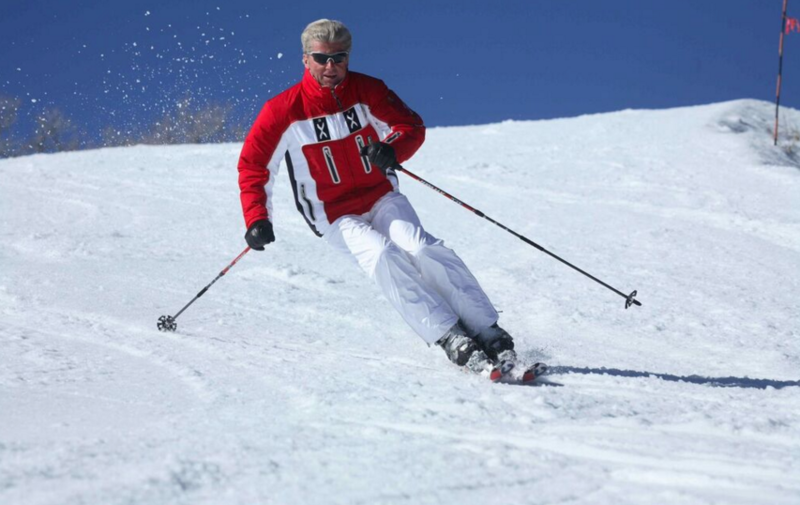 If I watch a really fast skier in World Cup, I’ll take his cadence and try to match it in my own run. I use it for visualization, so I’m not rushing or going too slow. How are you guys feeling this year? Brad: I had a rough week last week, I wasn’t there mentally and didn’t really perform the best I could at Lake Placid. It makes you itching for more; I’m going into the rest of the season with a different mindset. How many World Cup stops have you had, and what’s the remaining schedule? Bryon: We have competed in four already- and have Deer Valley, Russia, Norway, Sweden, Spain, and then Lake Tahoe for Nationals. Do you guys get down time in any of these places? Bryon: Not really. Once we get on the road – we get there, we train, we compete, and we leave. Brad: We might get a day in Norway. Brad: When we get to Russia it’s a test for the Olympics; we’ll be there a week early to adjust to the time zone. No sweet Japanese powder when you compete in Inawashiro? Bryon: No, (laughing) nah, we go to ski a gnarly course, super steep – it’s really steep. We’re having duals on it this year, which is pretty crazy. It’s like three cliff drops into the top jump, and you want to take as little speed as you can because once you land you’re booking. You’re out of control, basically, the one who can hold on is the one who’ll come out on top. Brad: I’m excited to ski it. It’s one of those courses growing up, you see it on World Cup and you’re like, oh my God. Deer Valley is one of those courses too. Bryon: Yeah, it’s a beast. Let’s talk tricks. Where do you see it going? Brad: Double flips, double anything. A Double Full is a seven twenty (note – two full spins) but it’s one single flip. They don’t allow two flips. Bryon: All the specs would have to change to allow doubles. They’re looking at a new format for dual moguls, this is a proposed thing, where they take out the bottom section, so it would just be a big table to finish off. That’s a huge transition in the discipline, that’s straight up incorporating park skiing. Brad: That’s what people want to see, you know? They love seeing the duals, big jumps, and big airs. People throwing their biggest degree of difficulty, I think it would be good for the sport. Are you prepared for doubles? Bryon: Yeah, we do them all summer so when they come we’ll be able to do them. Bryon: Double Cork 10 (two off axis flips with three spins) I haven’t done on snow, but on water pretty consistently. Brad: I think that would be the hardest one to throw with the amount of air we have. Bryon: You don’t want to take away from mogul skiing either, you’re skiing the moguls between the jumps as well. Brad: Fifty percent of the score is for turns. Bryon: Freestyle moguls are what we do. Who are some of the skiers you guys look up to? Brad: Our Wasatch (Freestyle Team) Coaches, Jon O’Brien, Rick Shanor, Scotty Meyer, and also growing up Tony Gilpin. When we lived in Montana he would compete against us all of the time, but that one dual that we beat Tony, it was a huge step. Our parents joke about it all of the time, but that’s when they said we’re actually going to go somewhere. Bryon: All of our coaches have had some kind of positive impact on our skiing, and our lives really. Brad: Yeah, exactly, knowing you can trust what they had to say. Bryon: Growing up in Montana there was this group of great local skiers that were kind of our role models. That was important for us to have up in Montana, to see where we could get. To have a tangible goal. If you weren’t skiing bumps, no ski team, none of that – what would you be doing? Bryon: We’re both into art. I do wood carvings; I really enjoy doing wood sculpture, trout mostly. I would get into that, a little more into canvas painting. Bryon: Our parents are really good artists. 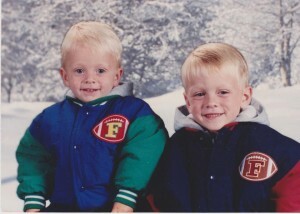 Brad: The other thing too, is we were really into a lot of sports growing up, football, and baseball. I think that or gymnastics would’ve been something we pursued. Bryon: We’re both competitive; I think we would have gone into something where we could stay competitive. Brad: To get where we are now our parents sacrificed a ton, they would have given up so much for any sport we do. After an hour of talking it was evident what motivates the Wilson brothers on their journey through the ultra competitive world of mogul skiing. Time and time again they gave credit to their parents and the skiers that they watched growing up as positive influences in their lives. 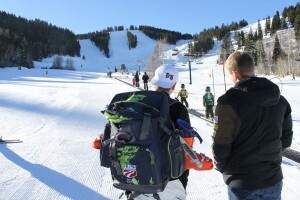 It is no wonder Deer Valley sponsors these young athletes in their pursuit of World Cup and Olympic victories. A shared value system and passion for skiing is evident after even a few minutes with Brad and Bryon. World Cup week is upon us and it is a blast! Head to the mountain to watch the men and women compete in aerials and moguls, paying close attention to the two former Jr. World Champions. This is a pre-Olympic year, a year when some of the most stunning and perfect runs will be laid down in one of the most difficult courses in World Cup bumps. 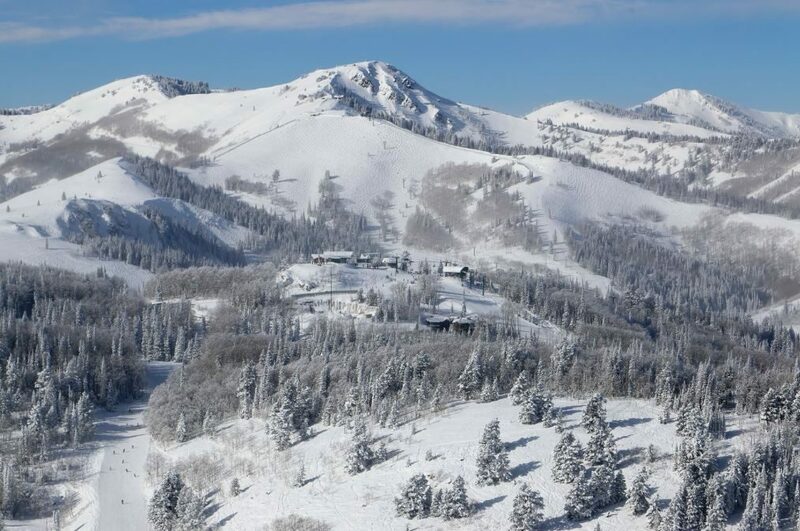 This is Deer Valley in February and you do not want to miss it! Want to see what it takes to win an Olympic Medal? Check this out. And is this the future of World Cup Mogul maneuvers? these kids are the best-what a wonderful family! Did you see that Brad earned his first World Cup podium this weekend? His final run in Dual Moguls on Saturday Night was amazing to watch!